A few weeks ago I received an Ebira Rod Quiver for review. I was thrilled, since I have been salivating over this piece of equipment for a while now. I went even so far to “convert” an old fly rod sock into a quiver (doesn’t look as cool though!) since I couldn't justify the expense of yet another piece of fishing equipment. The Ebira is meant to hold one Tenkara rod, although you could squeeze two rods into it but it would be definitively a tight fit. Rods equipped with Fuji Hook Holder systems for line management can be stored too, I haven’t experienced yet any flies from getting stuck inside. The top closes with a drawstring so that you don’t accidentally lose the rod (which I can’t imagine happening anyway, but it’s nice to know that you won’t). 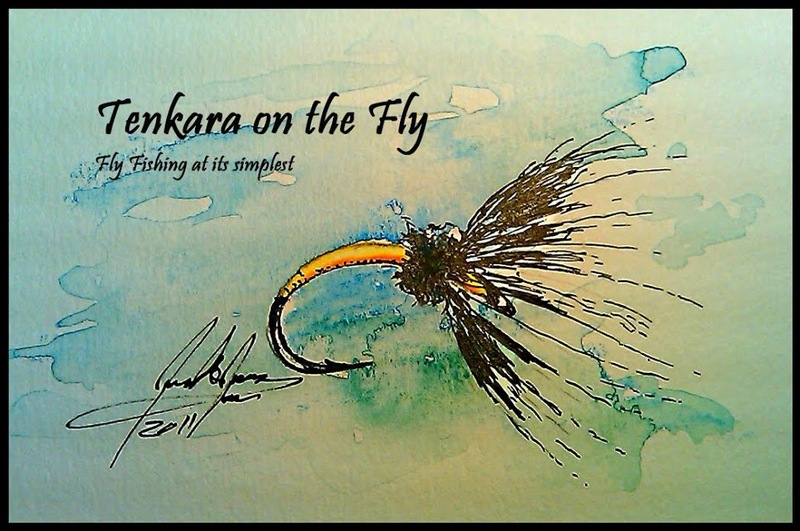 It comes in two sizes (22.5” x 2.5” for most Tenkara USA rods and 18.5” x 2.5” for the Backpacking Light Hane).The Tenkara USA version does not, however, hold the new Tenkara USA Ito which is 25.8” fully collapsed - yet, a new version that will hold the Ito will be available soon. You can also adjust the point of attachment of the shoulder string to be higher or lower, whatever is more comfortable to you depending on your size. You can access your rod without taking the Ebira off, simply swing it from the back to the front. When you do so, you will also be able to access a removable side pocket that will hold a small fly box, a line or two, nippers and tippet. Forceps can be attached to the adjustable cord as can additional spools of tippet. The Ebira is very light at 1.8oz and hence ideal for lightweight backpacking or staying true to Tenkara’s philosophy of simplicity. The material used is Dyneema-X, similar in look, touch and feel (although seemingly a bit more robust) to the Trico Pouch (review here) (both made by TrailLite Designs). Please note that this review is based on the Ebira Rod Quiver made from Dyneena X which is available for purchase at at TenkaraBum, not the one that is made from Cuben UL available at TrailLite Designs. Disclaimer: I am not affiliated with Backpackflyfishing.com, TenkaraBum or TrailLite Designs nor did I receive any compensation to review the Ebira Quiver, however, I received the Ebira Quiver free of charge for testing & reviewing from Backpackflyfishing.com. Great Post Karel. The Ebira is one of those pieces of gear that you just don't entirely "get" until you use one in the field. It's one of my favs and a brilliant design.